The Casio CGP700 and PX360 share many of the same features and functions but they are also different from each other in a number of notable and important ways. The first and biggest thing that both models share but what also sets them apart from the previous portable Casio models (and every other portable brand in this price range), is the new 5.3" all color touch screen using proprietary Casio touch App software with instant feature recognition along with a color screen which operates very much like a mini tablet including swipeable screens! I really should not get overly excited about this technology because many consumer products from educational kids electronic toys to family electronics have color touch screens now and instant feature recognition with swipeable screens, so having this technology in a digital piano should be no big deal...right? Well...actually it is a big deal because, at least for new digital pianos in the lower price range under $2000, these piano companies are way behind consumer and commercial electronics when it comes to user interfaces and built-in color touch screens. There are some piano manufacturers who are writing their own proprietary Apps to use on iPad and Android tablets so you can control a limited number of functions on your piano from your tablet connected by WiFi, Bluetooth, or USB cable connection. That's good but it only covers a relatively small portion of what those pianos can do and the screen is the external tablet and not a touch screen in the piano. It is also important to point out that the new Casio color touch screen is not set into the piano control panel completely flat. The screen is slightly raised and slanted for a good viewing experience which is much better than being flat, which I have seen in other brands that have any kind of display screen at all. So I do appreciate that extra "touch" of usability. However, in the world of digital pianos, this would be the first time ever that a top name well known digital piano manufacturer has designed and produced a digital piano selling for under $1000 that has a very user friendly, intuitive, large (as digital pianos go) 5.3" color touch screen with familiar settings and the ability to use the functions in a much faster and deeper way, without much effort. So I must give credit where credit is due...and that's to the Casio designers and engineers for coming up with an unexpected and impressive color touch screen feature which will allow digital piano owners to get the most out of their new Casio portable digital pianos which no other major digital piano brand can compete with at this point in this price range. Casio is, after all, a computer company that produces a variety of in demand consumer and business technology items such as digital cameras, watches, TV's, small color touch screen cash registers, language translators, calculators, and of course...keyboards & digital pianos. Casio has had a music/piano division for many decades and that division is able to take advantage of the technology that Casio uses in their other product areas, including the color touch screens which they now incorporate in these new digital pianos at a low price...pretty cool. 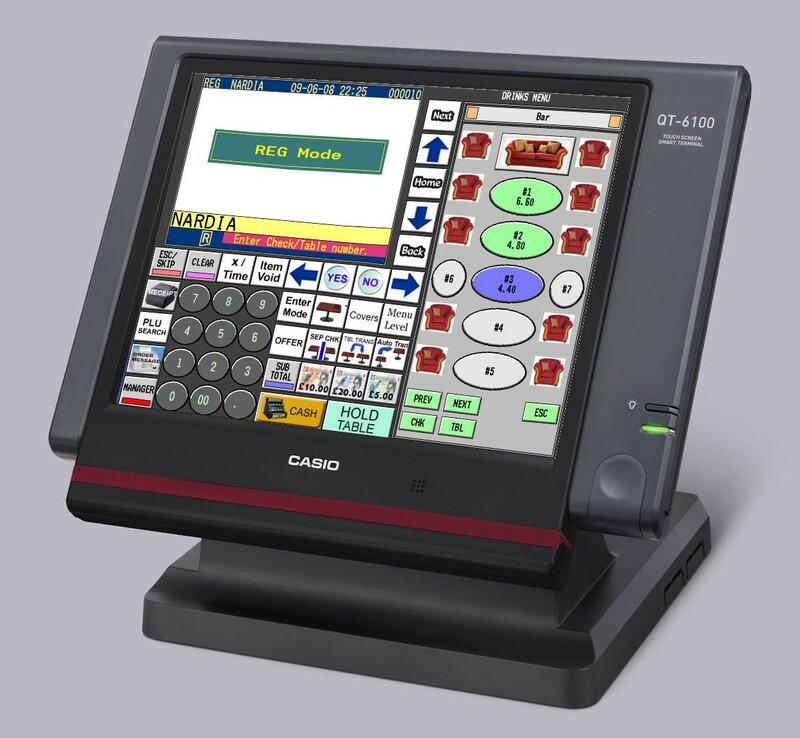 Along with the color touch screen and the features it has, Casio has included a round infinity (alpha) data wheel dial on the control panel to the right of the display screen which allows you to scroll through the functions in the touch screen. As an example, if you wanted to find a particular sound like a specific trumpet or piano sound, normally you would go through the library of sound groups and tones to get to the sound you want using buttons. The data dial on the control panel allows you quickly turn it in either direction which moves through the sound library or any other function quickly so that you can land on the sound or feature you want to. There is also an individual up and down button so that you can advance the features in the touch screen one at a time without using the data dial or touch screen. These functions are just other useful ways of selecting the feature (sound, rhythm, song, etc) you want once you have gone into the touch screen mode. Yamaha and Roland have had a data wheel (dial) in a few of their keyboard products for many years on a variety of their digital pianos, but this is the first time that Casio has included the data (alpha) dial function into their digital pianos, so that's a big bonus in terms of how the piano operates for both the CGP700 and PX360. Beyond the data wheel controller, Casio has also has some helpful buttons on the control panel itself which will take you directly to the most popular functions of the piano in the color screen including instrument sounds, rhythms,recording, transpose, etc. In other words, let's say you want to transpose the key you are in which is a very popular feature on digital pianos. Rather than go into the color screen and look for the transpose function which you can also access that way, you can just press the transpose button on the control panel and instantly it will transpose the key up or down a 1/2 step at a time. There's no guess work as to where the transpose feature will be in the color touch screen or where to find it because the transpose button on the control panel accesses that feature instantly. You can also adjust the transpose function in the touch screen by touching the appropriate selection and using the data wheel or up/down buttons to select the key. Then once you get to that function you wanted, via the buttons, you can then use the color touch screen to continue your search and/or use the data wheel to speed up your selection. There's just so many intuitive ways to access features on theses pianos that it makes using these two new models lots of fun...and if it's fun & easy, you'll enjoy it more and get more use out of it too. As far as the piano playing fundamentals of the Casio CGP700 and PX360 or any digital piano go, this would include key action, the piano sound, and pedaling authenticity. Of course, digital pianos need to have an internal speaker system to hear the sound, so the quality of that speaker system needs to be good too and I will discuss that later in this review. 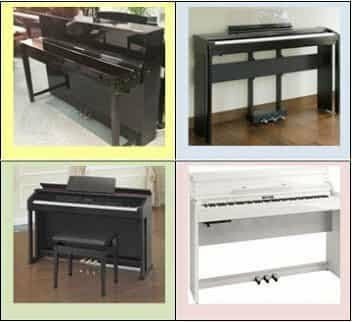 The key action piano keyboard is the most important thing to consider when shopping for any digital piano and the CGP700 ad PX360 are no exceptions. In the price range under $1000, there are four major brands worth considering at this point and that's Casio,Yamaha, Kawai, and Korg. There are other digital piano brands which offer one or more models under or around $1000 such as Kurzweil, & Roland and a couple of others. But as of now, those brands don't offer anything which competes well with Casio, Yamaha, & Kawai in this price range with regard to key action in my opinion. Korg has one model for $999 but it lags far behind the other 3 major brands. The CGP700 and PX360 key action are identical and also the same as in previous models from last year including the PX350, PX780, and the newer PX160, PX760, and PX860. All Casio key actions are the same so there won't be any confusion there, unlike other brands that offer multiple models of different key actions. The Casio key action is, in my opinion, superior to most other brands in this price range for a number of reasons including having a triple sensor keyboard for more accurate key repetition sensing and expression, more authentic piano key weight and movement in the keys, a better balance with graded weighted keys and better connection with the fingers, and having the addition of both ivory & ebony synthetic key tops which try to simulate the feel of real ivory and ebony acoustic piano keys from years ago. Today, real acoustic piano keys have mostly plain plastic top keys so synthetic ivory and ebony feel is quite nice because it offers a more textured feel along with being able to absorb sweat from the fingers which makes for a smoother playing surface. So when it comes to the Casio keyboard and realism in movement, in this price range they are very impressive, although I would not classify the key action as functioning and moving like a grand piano, especially on the black keys, because it does not. It is much more like a good upright piano and there isn't any other brand or model in this price range that would have a key action that functions like a grand piano either...so don't expect it. Casio, along with other manufacturers likes to add some "hype" to their marketing and promotion efforts, so with that in mind these people tend to exaggerate sometimes...especially in getting you to believe that their product is exactly like a concert grand in key action and/or sound. Really? 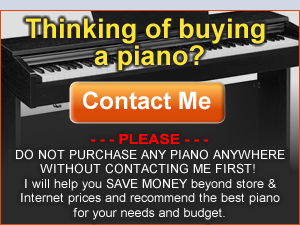 Then why buy another piano for more money or even a regular grand piano for that matter if their inexpensive digital piano supposedly gave you everything you could ever ask for? It's a ridiculous statement when they make it, but I have come to expect these things...because they are trying to get you to buy their piano, You just have to look beyond the hype and play the piano to know for sure, which I have. If you want something at a higher playing level, then you'll need to spend more money to get it. A good, realistic piano sound is also obviously important, especially to those who will be primarily interested in playing piano although the other instrument sounds can be enjoyable as well. But it's really all about the acoustic piano sound recreation and if it can be expressive with a large dynamic tonal range (which it definitely has), good organic piano sound elements like virtual vibrating strings, resonance, accurate legato and staccato piano sound, smooth key sensitivity volume and fast repetition sound reproduction, then that is something you want to look for. These things are not easy to get right, but Casio has done an excellent job of it in this price range. There are some "off-brands," as I call them, such as Williams (a Guitar Center brand) which does a very poor job of this in both areas and I don't recommend that brand (and a few others) at all for these and some other reasons. All of these piano sound elements and functions make for a more enjoyable piano playing experience and is necessary to have in a good digital piano. Dynamic tonal range means the range of tone from mellow to bright as you play the keys softly and then push the keys harder and quicker. Key sensitivity volume is when you press softly and get a low volume and then as you press the keys harder you get a louder volume. You are not supposed to notice any hesitation or jumpiness in volume and the volume range is supposed to be smooth and large. In these new Casio pianos that type of response is quite good. The CGP700 and PX360 both have 128-notes of polyphony processing power which is usually more than enough for most players when playing multiple notes and pedal sustain, even with a layered sound, Some digital pianos out there have 192 or 256 notes of polyphony processing power but I have personally found the extra polyphony to be unnecessary for playing a full song with lots of notes or to do recording properly. However, both new models are somewhat different with regard to the actual piano sound because even though the piano sound on these models are sampled or recorded from a high quality acoustic grand piano, the PX360 is more advanced in terms of the extra organic piano sound elements and nuances that are available in some higher priced digital pianos these days. If you listen to the CGP700 and the PX360 separately through a good pair of headphones, you'll be able to tell the difference in piano sound realism assuming you know what you're listening for or you have some piano playing experience. The PX360 has what's known as string resonance (aka: sympathetic string vibrations) as well as key release velocity (the sustained tone when you release a key depending on the speed of the release) both of which simply make for a more realistic piano sound experience, where the CGP700 does not have these features. The PX360 also has adjustable hammer response which simulates the percussive nature of the actual piano felt hammer although the CGP700 also has a very good percussive feel to the piano sound. When you listen to the both models through the piano internal speakers, it's a bit more difficult to tell the difference especially because the CGP700 speaker system is louder and fuller than the PX360, but it's certainly still there. In the PX (Privia) line of instruments, the basic Casio piano sampled sound is the same but it's all these other organic parts of the sound that make the difference, and when you leave any of these extra organic parts out, it reduces the need for more piano processing memory and therefore reduces cost. But the bottom line is...can you tell the difference in one from another and if you really can not, then it doesn't matter what the specifications say, it just matters what you like and can be happy with. It's true the PX360 will piano sound will sound more lively and expressive because of the increased piano processing memory and organic elements, but you can probably enjoy either model for its piano sound, and both of them are more expressive in my opinion than the competing models from Yamaha at this point, including the Yamaha DGX660 and P115. It's also worth noting that for the first time, Casio has introduced a special control panel button (upper left pic) called "Grand Piano" that instantly resets the piano keyboard to a grand piano sound. It's similar to a panic button when you have features and functions selected but you want to return to the main piano sound only. Although Casio has never had this feature before, Yamaha has had it for a long time in some of its models and it was always a function that I really liked, so it's definitely a welcome improvement on these new Casio pianos. When it comes to the pedaling experience, this is another important aspect to consider when shopping for a new digital piano. The CGP700 and PX360 both have pedal damper resonance and damper noise which is the resonance of the tone and physical movement of the damper rail in an acoustic piano.These two elements add a depth of realism to the piano sound when using the damper/sustain pedal. The pedaling also includes a half-damper effect which adds more incremental sustain times to the damper pedaling, but only if you are using the optional 3-pedal unit ($75 internet price). Pedal resonance, damper noise, and especially half-damper effect are very good features to have as you progress in your playing ability or already play well. A person can certainly live without it but it's better if you can access it. 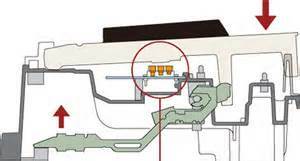 However, as I mentioned, you'll need the optional triple pedal unit to access the half-damper sustain effect on the Casio's. Kawai also has half-damper function on their brand new popular ES110 portable piano ($729 internet price) and that feature can be accessed with the included full size single piano pedal, unlike the Casio's. I was hoping Casio would have updated their half-damper access from previous models, but they did not. So that's a negative (although a smaller one) in my book. As far as pedal decay time which is how long a note will sustain after letting go of the key and holding down the sustain pedal, the CGP & PX do a fairly good job. The sustain time is fairly long on sustained notes but I have heard other digital pianos with even better (longer) decay times, especially on the higher notes, but those digital pianos would cost quite a bit more money. So in this price range the Casio pedaling experience is, overall, a very good one. OK...now on to the fun stuff. The new PX360 and CGP700 both have a whopping 550 built-in instrument tones and 200 built-in rhythms & ensemble chord arrangements. When using the variation feature on the rhythm arrangements, you then get another 200 selections which gives you a total of 400 rhythms/ensemble arrangements. So when it comes to having a variety of enjoyable instrument sound and rhythm patterns and musical arrangements (aka:one man band), it's difficult to need more than that. Casio has increased and advanced the realism of many instrument sounds from previous models as well as the musicality and voicing of the rhythms & arrangements. The increase in realism on some of these selections was quite noticeable to me and made for a more expressive playing experience with all styles of music including classical, jazz, rock, big band, oldies, Latin, country, modern, world music, and everything in-between, and most of them sound great considering how little these pianos cost. The intros and endings as well as drum fill-ins and accompaniment patterns were surprisingly good and far better than on previous models. All of it was expressive, musically realistic, and plentiful. Casio also inserted some very cool, very realistic musical ritardandos, crescendos, decrescendos, and syncopation into the intros and endings making the music sound more natural instead of digital and robotic, and it's done in full stereo with stereo panning as well. The Casio sound and accompaniment designers/programmers really have done an outstanding job upgrading these particular features as compared to past models, although there are a few auto accompaniment styles that do sound toy-like and amateurish, so they are not all great...but I expected that. When using the auto-accompaniment feature you can play simple 1-finger left hand chords, 3-finger chords, or full professional chording playing both left and right hand together with multiple fingers over the accompaniment and the accompaniment will follow you. As far as the solo instruments go, many (but certainly not all) do sound noticeably more authentic than in previous models, as I mentioned earlier. Beyond offering a variety of acoustic piano sounds, these instrument sounds would include much better electric pianos, brass, organs, woodwinds, strings, etc, and the variety has increased from the previous 250 selections on previous models to the updated 550 selections, which is a very big jump in the amount of available instruments for Casio, but some of the instrument sounds have not been upgraded much or at all from previous models. As an example, the guitar sounds, whether they be electric, classical, or steel string, are mostly just average and not as convincing as I had hoped for in these new models. But they are still fun to have and are certainly better than other digital pianos I have played in this price range under $1000, and if you are not too critical, you may like them just fine. Also, the trumpet instrument sounds (and a few others) aren't that good in my opinion, but it's really not often I need a trumpet sound in a digital piano:). However, they are all quickly accessible through the color touch screen and there are picture icons for each sound group so you just touch it and that group of sounds or rhythms instantly comes up. When it comes to these 2 new models and their ability to make you sound better than you are which the previous features definitely do (and that can be a good thing:), Casio has a very cool feature called "Auto-Harmonize." One of the goals of any student or musician is to play a song so it sounds as full as possible with multiple notes being played by both the left and right hand. Most of the time students and recreational players know how to play accompaniment chords with their left hand, but playing multiple note chords simultaneously with your right hand takes many years of learning and practice to accomplish this. Some people get to that point but most people do not. They can play chords with their left hand with a one (or maybe 2) note melody with their right hand. So wouldn't it be special if you could play one note melodies with your right hand as your left hand is playing the full 3 or 4 finger chords and have your right hand one note melody sound like 3 or 4 notes playing correctly every time you play one key on the right hand? Well...that's what the "auto-harmonize" feature does for you. It automatically harmonizes the right hand melody with your left hand chords and makes it sound like you are playing multiple notes on your right hand even though you are only playing one key! The harmonize function also works when playing simple 1-finger chords on the left hand so that a complete beginner can sound like they have been playing for years:). The right hand harmnize feature includes 12 harmonizer variations for your melody accessible from the touch screen and it really does make your right hand sound like you've been playing multiple fingers for years...even though you're just playing one key at a time. This feature can be selected on or off directly from the master main screen in the touch display so it's easy to use. Whatever chord your left hand is playing and whatever song style you are playing in, the auto-harmonizer automatically adjusts the right hand melody to sound big and full in any number of musical styles while using the accompaniment section. OK...I know that some people will call this harmonizer feature a waste of time and an unnecessary toy. But when you try it, it will definitely bring a smile to your face because it makes your music sound fantastic, and if you don't play well, then I say that you should use all the help you can get:). It's great to learn how to play properly and manually...but as a long time piano teacher I always encourage my students to have fun and do whatever it takes to keep playing and enjoy the music....and that's what this feature does. Along with the instrument sounds and automatic features, there are also some impressive new drum kit sounds in the instrument sound library of these new models for playing individual percussion on different keys. This is not a new function but what is new is the noticeably higher quality of the stereo percussion samples and the fact that the drum sounds are velocity sensitive for tonal changes. On a normal drum kit as you play the drum harder you not only get a louder volume, but the tone of the drum changes from mellow to bright or a loose sound to tight sounding percussion. Previously only the volume changed when you played a key harder or softer on the percussive sounds (cymbals, tom, snare, etc). Now the actual percussive tone changes as well, which is a big leap in technology and I don't know of another digital piano that can do this in the price range under $1000. This may not be important to some people, but to others this is very cool because you can make percussion recordings as well as play live and it sounds very realistic. Because of the easy to use large color touch screen, all of these features are now much more accessible so chances are you'll want to use these sounds because you can get to them so easily. Some extra useful features that many people like to have include instrument sounds which can be layered two at a time to play the sounds simultaneously, split two at a time with one on the left and right sides of the keyboard, have special effects added to the sounds including reverb, chorus, delay, adjusting EQ/brilliance, and using special DSP digital processing effects for further sound enhancement. The previous model Casio's had 4 levels of reverb, 4 levels of chorus effect, and 3 levels of brilliance control. These new models have 4 times as many selections and variations so that's a huge jump in instrument sound control along with the additional effects offered, and they are all selectable in the color touch screen along with using the data wheel if you prefer to scroll through the various option that way. The CGP700 and PX360 also have a feature rich built-in recording studio system including a full 16-track (16 instrument multi-track) MIDI recorder and playback system along with a 1-track wav file (CD quality) audio recorder and playback control with 100 song recording and playback capacity. The length of time of recording for the MIDI recorder is 50,000 notes and the CD quality audio recorder time per song is a huge 74 minutes long. So when it comes to recording features in this lower price range, nothing beats or comes close to these two new models. There's a number of recording editing features that allows the process to become more detailed than just a simple digital recorder would offer. But what really sets the recording system apart from all other new digital pianos under $1000 is the user interface controls in the color touch screen. Typically, recorders in digital pianos are not very easy to use, especially multi-track recorders such as what's in these two new pianos. So...when features are more difficult to use, then people may not use them very often or at all, especially some of the more complex features like these recorders. The recording functions are nicely laid out in the color touch screen and are easy to access and you can even get into the recorder screen from a button on the control panel which makes it quick and easy to record. When you touch a recorder function on the color touch screen, then you can access a variety of features in that screen without too much guess work. Rather than go into all the recorder functions and features, you'll just have to take my word for it when I say that creating, making, and playing your own music in the CGP700 and PX360 is super fun and allows you to express yourself in ways that many digital pianos cannot do. The closest competitor to these new Casio pianos when it comes to recording is the the Yamaha DGX660 ($799 internet price). The DGX660 only has a 5-track multi-track recorder which is good, but nowhere near the Casio recording system in my opinion. Also, the Yamaha display screen is a bit smaller monochrome (non color) display that is not a touch screen, so using the Yamaha recording features is not as easy or as fun to use as what's in these two new Casio models. The Yamaha display screen was the obvious winner prior to these two new Casio pianos coming out, but for now Casio has caught up to and surpassed Yamaha in this way. Speaking of MIDI recording & playback, the CGP700 and PX360 can playback General MIDI song files which allows you to hear and play along with your favorite songs which you can download off the internet on a variety of sites, assuming you don't already have your own MIDI song files. Also, two of the most popular lesson curriculum's available today and used by piano teachers all over the US and the world are by Alfred and Faber & Faber. 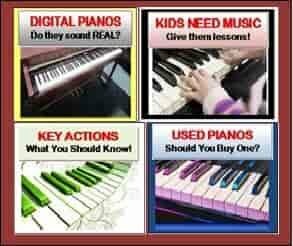 Both of those lesson book series have option General MIDI songs which you can purchase and then play back in these Casio pianos through a USB flash drive. This function with available songs allows you to hear the lesson song in the book you're using and get a better feel for the rhythm & timing of that song along with being able to slow down the song to any tempo while learning that piece. There are literally thousands of General MIDI songs available on the internet and through these two publishers which makes the learning and practice experience at home much more fun and enjoyable. I have been using the MIDI song play along method for years and find it to be very stimulating because it's like playing along with the orchestra or band. So regardless of your playing skill level whether it be beginner or very advanced, you can definitely have a lot of fun taking advantage of what these two pianos can do with regard to playing back General MIDI songs files...and the fact is, they make you sound better than you already are and if you don't play at all, then it just makes learning a more enjoyable experience. If you have questions about the General MIDI format, how to use it, and what it can actually do for you on these pianos, just ask me. The CGP700 and PX360 have an interesting and fun feature called Music Presets which is a library of left hand chord progressions & arrangements from famous songs. Specifically what this function does is play a well known portion (aka:chord progression) of a famous song from a variety of songs in the Casio Music Presets song library and then loops that part of the song so it will play over and over without stopping. When you select a song and start it up, the color touch display screen shows you the name of the tune and displays the actual chord symbols of the left hand chords of that chord progression loop. The idea is for you to be able to "jam"along with your right hand and play melody notes along with the playback of the left hand chords in that chord progression. Basically it's like playing the piano along with the band only this band just plays a famous portion of the song (not the whole song) and does it over and over until you want to stop. This system allow you to learn to play by ear, to improvise, and to have fun while you do it all the while looking at the chord symbols in the display screen so you know what notes will fit depending on the chord playback progression. The more you hear the chord progression loop and the more you see the chord symbols in the display screen, the easier it will be for you to follow along, "jam out," improvise, and feel like you are in the middle of the band or orchestra. You can actually play with both left and right hand during the playback of the Music Presets library which includes 305 different selections. I used this feature many times and it's definitely lots of fun and quite musically stimulating and something that few other digital pianos have. For people who have taken their time to setup the instrument sounds, rhythms, and functions in a variety of ways, and you want to return to those settings later on without to re-create them, then these new models offer 96 registration memories for that very purpose. In other words, you can store your setup in a memory slot and recall it any time you want...and 96 memory slots is a huge amount of memory storage for your favorite settings. This is great if you are playing live somewhere and your need a variety of different functions to come up quickly and you don't have time to manually set them up. You don't need to be a pro to want and use registrations memories. You may be a beginner having never used a sophisticated digital piano like the CGP700 or PX360 before and maybe you just were fooling around with all the settings and you came up with something that sounded great to you and you did not want to lose it...so you just save it and then you just recall any of the 96 memory settings and it quickly puts you back into that original setup you did...that's very cool and quite useful too. Other features I really like is the ability to quickly and independently balance the volumes on all of the settings including the lower keyboard sounds, upper sounds, accompaniment, master volume, MIDI volume, audio volume, metronome volume, touch sensitivity velocity, and even using a digital mixer to adjust the individual volume of each of the 16 MIDI recording & playback tracks. You can change the speaker output in the system menu to either on or off independently for both internal speakers or external speakers (stand speaker system in the CGP700). You can even change the piano tuning using different tuning temperaments along with piano stretch tuning. You can setup the 88 keys to play in a Duet Mode so that two people can play at the same time, each with 44 notes where both keyboards produce the same notes in the same octave. You can change the octave of any instrument sound whether playing solo or combining with another sound with the octave changing feature in the touch screen. There are just so many features and functions on these new models that you will likely not use them all...but it's nice to know they are there in case you need it...and these two new pianos definitely have more features that I ever expected. Casio even put in a digital/virtual typing keyboard as a touch screen software feature so you can enter typing characters (as you would on your cell phone for texting, etc) to locate and save songs and other data you need to find. The built-in speaker system in both pianos (in the piano keyboard itself) is the same with 4 speakers (2 larger, 2 smaller) going into 16 watts of power producing a reasonably loud volume for a smaller portable piano. However, the PX360 is optimized to be even louder and sound better than the CGP700 because it does not have a speaker stand like the CGP700 does and is dependent on its own internal speaker system. The speakers and design of the internal sound system inside the PX360 piano has been completely redesigned from previous models so they do sound better than before. The CGP700 has an additional speaker system built into the included furniture stand (included with the CGP700 and not sold separately) whereas the PX360 does not have this feature. The additional "speaker stand" gives the CGP700 a huge boost with regard to volume and sound quality coming through those speakers interacting with the the top piano speakers and the result is far more bass response and double the volume output to 40 watts of power with the speaker stand system connected to the piano top. This would make the CGP700 one of the best sounding, most powerful digital pianos under $1000 with a 3-way, 6-speaker sound system with included speaker stand. I can tell you first-hand that I thought the sound coming out of the CGP700 was amazing and easily out performs any and all of the other portable digital pianos on the market in terms of internal speaker system sound quality and richness and can easily fill a large room. But the CGP700 must be connected to its furniture stand to make this happen. The PX360 does not have the option of a "speaker stand" to add to the sound like the CGP700, and it is not meant to have it because Casio designed the PX360 to be an instrument to also be taken places and be connected to external speaker systems and serve a slightly different purpose. However, when playing the PX360 in your home, you can connect it to any home stereo system or monitors using the 1/4" audio output jacks on the piano to increase the sound quality and bass response of the piano in that way if you feel it necessary. The PX360 is $100 more than the CGP700 so you would expect to get a bit more on the PX360...right? In fact, you do get more in some specific ways. In addition to all of the the identical features between the two models, which is just about everything they do, the PX360 looks a bit different with additional sportier graphics on the top of the keyboard control panel, more editing and music creation functions including the ability to create 10 user rhythm arrangements in which you can use the rhythm editor to modify a built-in Accompaniment and create an original rhythm of your own, have 100 user songs for song expansion, and setting up "one touch presets" which gives you one-touch access to tone, tempo, and other useful settings that go well with the currently selected Auto Accompaniment rhythm patterns. On the PX360 you can also edit the Music Presets that I talked about earlier which allows you to have a "jam session" of your own with preset chord pattern progressions of famous songs. You can create your own customized Music Preset patterns and edit them in a variety of ways with 50 user memories of Music Preset storage. The PX360 also has an Audio Line In volume control in the touch screen system setting which allows you to independently control the input volume of an external device coming in through the piano such as a microphone, audio recorder, mixer, electric guitar, computer, tablet, or any audio device in which you need separate volume control apart from the master volume control on the piano. This is a very cool feature and not found on the CGP700. Of course, as I talked about earlier in the review, the PX360 has a more realistic acoustic piano sound (as compared with the CGP700) with the added organic sound elements of string resonance, key release velocity, and hammer response. In fact, the PX360 touch screen allows you to go in and individually & incrementally customize the string resonance depth and hammer response to your particular taste. The PX360 has an extra assignable pedal input when the optional triple pedal unit is not being used and that assignable pedal is selectable in the PX360 touch screen. As for the piano connectivity, both models have a variety of connectivity for other devices with of the inclusion of 2 mini stereo headphone jacks in front, on the back of the piano two 1/4" audio output jacks to connect to external speakers, an audio-in stereo mini jack with separate volume control (for iPods, iPads, mics, and other devices), and a damper pedal jack using an included plastic sustain pedal which is small, but basically OK (at least Casio includes it for free rather than it being an extra cost). Both models also have a high speed USB output to computer or tablet device with is "plug & play" class compliant. 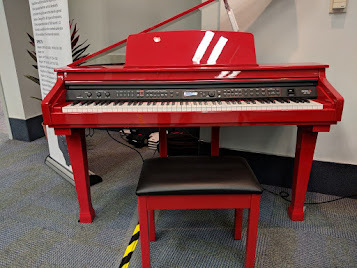 They also have an input for a USB flash drive on the front of the piano to load audio and MIDI song files as well as save them from the piano after you have created your own song. The PX360 also has two full size 1/4" line-input jacks and the internal piano effects such as reverb, brilliance, etc will apply to the connected devices (mics, etc) going through those input jacks...and that's a very useful feature and not something that Casio has ever offered before. The PX360 also includes standard MIDI cable connections for both MIDI in and out ports. There's still quite a few people who have MIDI products (sound modules, keyboards, etc) that only use MIDI connections and not USB. So the built-in MIDI connectors on the PX360 is a very big thing for some people and many digital pianos in this price range don't have this feature. Those are the differences between the two models as far as I can tell, although there could be a couple more that I missed:). Whether or not you think the differences are important one way or the other depends totally on your musical needs and desires. It is important to mention that both new models may need an additional external speaker system if you need to play for a larger group of people in a noisy room such as at an event, depending on the situation. As I said before, that's why both models have two 1/4" audio outputs for that very purpose. 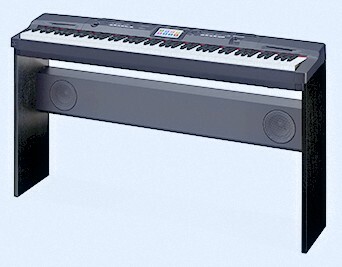 In the final analysis, a person can enjoy either of these new Casio portable digital pianos whether it be the CGP700 with included speaker stand, or the more editable and professional PX360 at $100 more, but not including a furniture stand and extra built-in speaker system. It actually may sound like the lower priced CGP700 would be the better option because of the built-in speaker stand giving a big boost to the sound quality and also not having to shell out approximately $100 for the optional CS67 furniture stand on the PX360 which would then make that model nearly $200 more than the CGP700. However, there is a value in having an upgraded acoustic piano sound in the PX360 which the CGP700 does not have and that's something you cannot add to the CGP700. It just depends on your musical experience level if you can recognize the upgraded piano sound difference? Regardless of that, these lightweight (26lbs) portable digital pianos offer a 3-key sensor synthetic ivory & ebony large dynamic range key action, smooth tonality and key volume response with excellent touch sensitivity, a more accurate (in my opinion) graded weighted key action than comparable Yamaha or Roland models in this price range, and a user interface color touch screen operating system that no other brand can touch. But with all digital pianos in this price range there will always be things in these models that could be better but then you would need to pay quite a bit more money for those pianos, just like anything else you would buy. However in my opinion there is little if any reason to look at any other brand at the moment when it comes to this price range for a full featured ensemble auto-accompaniment portable digital piano. 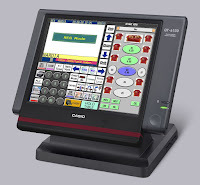 If you think you will seldom want to use the various and plentiful features in the CGP700 and PX360, then you should invest your hard earned money in a different model that will better fit your needs, such as the full size Casio PX770 or slightly higher priced PX870 which is the top of the line Casio Privia internet furniture cabinet model right now. It just depends on your musical goals and how much of a "fun factor" you want for your music when it comes to selecting any new digital piano. Just like any consumer product you can buy, there are always better models and that's true in digital pianos with more authentic key actions, piano tone, pedaling, etc, along with improved internal speaker systems on higher priced models from Casio, Roland, Yamaha, Kawai, and a couple of others. However, as I said, they will all cost you more money so if you want to stay under $1000 and like what these pianos can do and you like lots of digital features, then buy one of these new Casio's because you will most likely not be disappointed whether you are a beginner, intermediate, or advance player looking to keep the price low. The new CGP700 and PX360 pianos may look like "toys" to some people, but they definitely are not. Before you do anything or buy anything from anybody, do your homework and your research and then please contact me first because music is my passion and I can help you make the best buying decision for your needs. 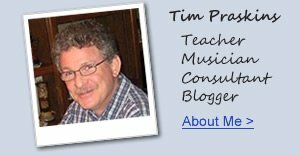 If you want more piano info and LOWER PRICES than internet or store discounts, please email me at tim@azpianowholesale.com or call direct at 602-571-1864. Thanks for the review, I've been waiting anxiously. To hear about the new PX Previas. I've got a Casio wk7600 that I use a lot in jam circles, and have been pleasantly surprised that the sound quality and volume is enough for quieter circles, and I've come to regard it as the minimum acceptable. So as I contemplate doing a substantial upgrade to the Casio PX 360 or 560, it's really important to me to know if the volume and quality of the internal speakers are at least on a par to the WK7600. Assume they are optimized for being up against a wall, which would bounce the sound against the wall, or possibly to project out to listeners. As the player, is the volume heard as being at least as loud, and as a listener the same question. Once again thanks! Hi Tim! I'm Kari. I'd like to give you a huge THANKS for this blog! This has helped me keep my sanity during this piano-shopping quest I'm on. I'm a beginner and I'd like to get something that I could grow with and would still love 20 years or so from now (hopefully, if both the piano and I survive). I am mainly interested in learning classical so I am not too interested with the drums, synths and all that stuff. I'd like to get something that feels and sounds and maybe looks (listed in order of priority) as closest to an acoustic piano as possible while keeping the price easy on my pockets (I'm just a hard-working 21 year-old dreamer). Sorry, I've listed a lot but I am very confused and also very indecisive. So can you kindly please act like my father and just decide something for me please. Also, please feel free to suggest something better not listed but also well within the price range. I'd really appreciate a reply. all good, all different, all different price ranges, all difficult to compare. It could take days and maybe weeks for you to decide what is best for you if you do not narrow down your requirements. In 20 years you could have become so good as a player that none of these pianos will likely be appropriate at that time. Wait until you have unending money to make the perfect purchase or lower your product and expectations for now. Could you tell us if the Casio PX-360 and the Casio PX-350 sound has any difference? Since the use the same sound source(AIR). Also, how does the CGP-700 compare to the PX-350 sound? Since it is the only keyboard of the three that has a different sound source (MXi). Also, could you tell me what the quality control and reliability and build quality of the casios are? I'm thinking of buying a Casio CGP-700/PX-360 but I'm worried about taking a risk on an untested technology like a touchscreen which usually end up konking out all the time. Basically, I'll be taking my CGP-700/PX-360 abroad from the country I bought it from so I won't have a warranty. Thanks. I'd love it if you could chime in with your qualified opinion. The PX360 has an upgraded piano sound chip as compared to the PX350 and therefore sounds even more realistic. The CGP700 sound chip uses less memory to capture the original acoustic piano sound as compared to the PX350. However due to the vastly upgraded speaker system in the CGP700 over the PX350, it is difficult to tell there is a difference in the actual piano sound between the two models. You must not have read my review too closely because I went out of my way to say that Casio is using their color touch screen technology in other non-music Casio products and those products have been out on the market and tested for some time, so I am not worried or concerned about the color touch screen reliability as Casio has had an excellent record with that kind of technology. Casio is a famous long time Japanese brand just as Yamaha and Kawai are the same. They all have good track records and good warranties to cover their products. You mentioned, an "optional 3-pedal unit ($75 internet price)." Do you have a link to one. I can only find 3-pedal units that are mounted to a board to mount to a fixed stand. Is there one made for use with an X-stand? the optional 3-pedal unit is the Casio 3-pedal pedalbar which is a plastic cross bar with pedals and attaches to the Casio furniture stand of the piano. Unfortunately, there is not a non-pedalbar single 3-pedal unit for any Casio piano product which can be used with an x-stand. I wish there was, but there is not at this time. Can the CGP spreaker stand be used with a PX360 keyboard. If not then why? Hi Tim... I just wanted to comment on the thoroughness of your review. It was very well done, laid out perfectly, and should be the "go to" article for anyone thinking of getting either of these new Casio models. I do recommend that those who are serious about these models, to read and re-read your article several times. I've picked up new things each time I've read your articles. Even with the video reviews that I do on Youtube (including these models), your articles are a fantastic resource that I've been recommending to people. I know the PX360 is a 2016 model and that it has a plethora of features the Kawai ES100 doesn't have. But just coming from that review I wondered about the ES100 when you say "In the price range under $1000, there are really only two major brands worth considering at this point and that's Casio and Yamaha." And also when you mention exceptions you don't mention Kawai. Where did the Kawai ES100 go in that consideration? Is the reason that it's not compared to the PX360 that the difference in available features put these two in different classes? Hi Tim. Awesome review, thanks! I'm aiming for the PX360, but it's not out in Norway yet, so I can't test it personally yet. But I tried the PX860 today and I loved it. You write in this review: "The CGP700 and PX360 key action are identical and also the same as in previous models from last year including the PX350, PX780, and the newer PX160, PX760, and PX860." So I should get the same feeling on the PX360. "Regarding your question, we can inform you about the following. The model PX-360 and PX-560 are sharing the same keyboard unit. PX-860, AP-700 and AP-460 are sharing an other keyboard unit. " This has me puzzled. Is there only a theoretical difference between them? If I loved the PX860, will I love the PX360 for sure? I can confirm it after comparing PX 360 with PX 760. The PX 360 has more key pressure and is closer to the grand piano feel. Even new PX 770 and AP 270 have much softer touch and I doubt they can be useful for professional pianists. Now I search for a newer Casio model havign the same keyboard as PX 360 but with better piano voice. I am planning to buy a digital piano. As per your reviews, I have narrowed by options to Kawai ES 100 and Casio PX-360. Out of these two models, which one sounds near to acoustic grand piano and keyboard feel. Hi. Thanks for the great review. I am looking for a present for my wife who has played the piano for church groups for a long time but had to give up when we got married and couldn't afford a piano at the time. Which would you recommend for a piano hobbist that enjoys playing very much and might use the piano as a portable weekly for small group sessions: the Kawai ES100 vs. Casio PX360? Only the Kawai ES100 is available here right now but I heard the Casio will be here shortly. Thank you for your great reviews! I'm sitting right now and waiting for a today's delivery of my new PX360 :-). I just got my PX360 and, as you wrote, it is a winner. Since I'm still gigging, the light weight is a great boon. (I can't believe I used to lug around a Rhodes suitcase piano in the 70's!) Re: the included pedal: Any aftermarket pedal with selectable polarity will work quite nicely. Re: the front panel USB port: You can plug in an inexpensive gooseneck light for reading music in a dark environment. This inexpensive ax is taking the place of my (beloved) Kawai MP6! I would describe myself as novice piano-player - though I had a few years of piano-lessons 20 years ago.. learned on the upright piano of my parents, but not very diligent ;-). Now as an adult I tested with a cheap Yamaha Piaggero for a few months, if I really want to play piano again and the answer is YES. Even I feel the limits of the Piaggero keys and now want to invest in a "real" ePiano. Since I enjoy playing with accompany and not being limited to piano-samples only (though this is the most important) I looked for DGX 6xx and reading your reviews brought me to the Casio Privia 350 or 360. Now the question - currently the 350 is sold 200€ cheaper, than the new 360. I would have the budget for both, but nevertheless evaluate, if the additional investment is worth it. I like the improved user-interface of the 360... but this alone would not be worth 200€ for me. Did the piano-sound quality improve noticeable from 350 to 360 (I will usually listen through good headphones)? I see it now has string-resonance... maybe also better samples or other benefits? You review is very thoroughly, thank you very much.